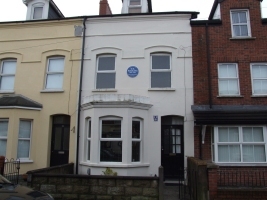 William Robert Rodgers was born in Belmont, Belfast on 1 August 1909 and educated at Queen’s University, Belfast, and the Presbyterian Assembly’s Theological College. He served as minister of Cloveneden Presbyterian Church near Loughgall, Co Armagh, from 1935 to 1946. Here he began to write, and his first published poem appeared in The Listener in 1938. A volume of verse Awake and Other Poems followed in 1941, and met with critical acclaim. 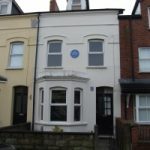 His talent as a writer for radio led to him being persuaded by Louis MacNeice to join the BBC in 1946 as a scriptwriter and producer for the Features Department. He was an innovative broadcaster, using new technology and techniques, and was especially associated with programmes of Irish literary interest. In 1951 he was elected to the Irish Academy of Letters, and in 1952 produced his second collection of poetry, Europa and the Bull. That same year Bertie Rodgers resigned from the BBC, but continued to contribute to its radio programmes. A series of broadcast conversations begun in 1949 pioneered oral literary history, and employed a form of sound montage called “the Rodgers technique”, juxtaposing several voices together. Scripts of this landmark series were published as Irish Literary Portraits in 1972. In 1955 his most celebrated radio play The Return Room, a poetic drama of boyhood in 1920s Belfast, was broadcast on the BBC Home Service. In 1966 Rodgers was appointed writer in residence at Pitzer College in Claremont, California. He died in Los Angeles on 1 February 1969 and is buried in Loughgall. 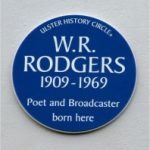 Renowned as a conversationalist and remembered by one reviewer as “a gentle genius”, Rodgers is acknowledged by his fellow poet Michael Longley as “a latter-day metaphysical who apprehends the divine through the senses ‘The Word through words'”.